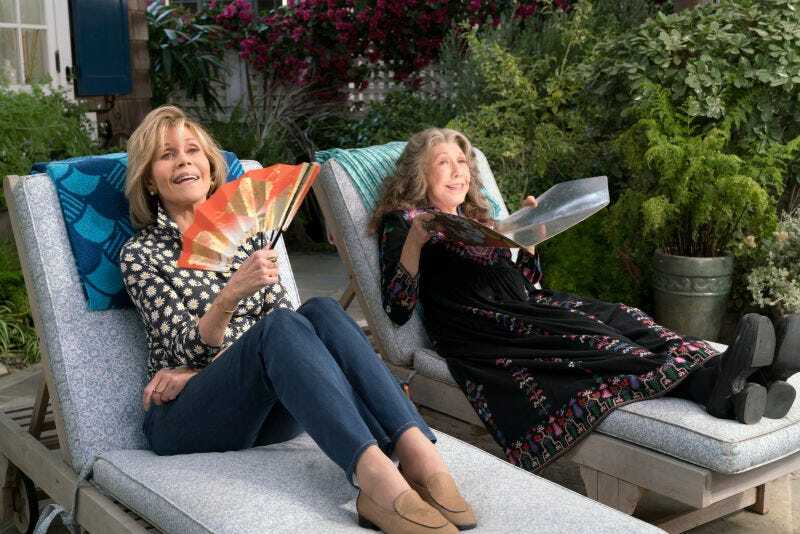 It looks like Vybrant will stay in business, as Deadline reports Netflix has renewed Grace And Frankie for a fifth season, which is expected to arrive in 2019. The sweet and ribald dramedy stars Jane Fonda and Lily Tomlin as the titular annoyed acquaintances turned best friends and entrepreneurs. Martin Sheen and Sam Waterston play their ex-husbands who are now married to each other and pondering an open relationship. All four characters must deal with aging, retirement, and their adult children played by June Diane Raphael, Ethan Embry, Baron Vaughn, and Brooklyn Decker. Over the course of four seasons, Grace And Frankie has expanded its scope, shifting from the moving-on phases of the divorcées to their second—and third—acts. The fourth season finale saw Grace and Frankie devastated by the temporary loss of agency and the seemingly permanent loss of their home. But it doesn’t look like the fifth season will take it any easier on these industrious old broads; RuPaul is set to guest star as Benjamin Le Day, “a formidable and quick-witted adversary who faces off” with the Vybrant owners.